You are extraordinary. You have built this charity. We could not cope without you. Tributes have been paid – at a celebratory thank-you lunch attended by up to 150 volunteers – to the 261 volunteers who underpin every element of the work of N-Vision, the Blackpool Fylde and Wyre Society for the Blind, which supports 2,500 people living with sight loss. Last year, volunteers contributed 14,408 hours voluntary service to the charity, which has headquarters on Bosworth Place in South Shore. That equates at current national minimum wage (£7.83) to £112,814 – and some loose change. Volunteer coordinator Stephanie Beasley said: “It’s a sum we couldn’t afford. “Without the support of volunteers, we would not be able to offer the many services we do. “They are all unsung heroes. And we always need more!” Clive Hirst, chairman of the board of trustees – another voluntary role – said: “Volunteers are at the heart of all we do. “You are extraordinary. “You have attended the university of life, you all have personal experiences and personal values that have led you to volunteer. “You come from all walks of life, but there is one thing we all share and that is we believe we have a duty to help other people – particularly those who need our help the most. “Thank you from the heart for what you do. “It’s been a good year for N-Vision. We have widened our remit to offer support to more people. We are stronger and a lot of that is down to you – we could not cope without you. “We have a sense of progress and possibility – it’s a fantastic organisation.” Of the 261 volunteers, 167 record and produce the charity’s weekly Talking Newspaper, including some who have been involved from the very start of the service for visually impaired listeners – back in 1977. Thirty-three volunteers help out in the society’s charity shop in Highfield Road and six at the shop on Victoria Road West in Cleveleys. Fifteen help in fundraising, 13 at the Low Vision Centre, 10 are trustees, nine assist at the Princess Alexandra Home and eight help out at the social centre. 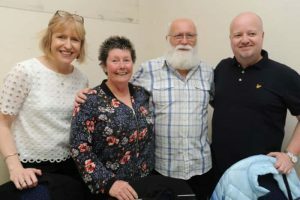 Around 20 volunteers – including those who are severely visually impaired – help out in more than one area of the society’s work, such as with the satellite café clubs run across Blackpool, St Annes, Poulton, Fleetwood and Cleveleys. The longest serving volunteer is Joy Killip, 93, who has read the news for the Talking News since the very start, but also volunteered for the charity as fundraiser long before. “Volunteers don’t do it to be thanked – but it’s always nice!” To become a volunteer, call (01253) 362696.